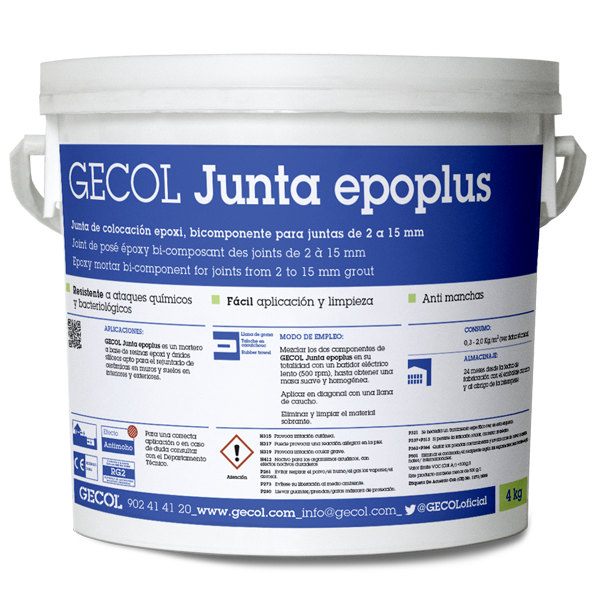 GECOL Junta epoplus is a mortar for installation joints based on epoxy resin. Bicomponent, easy to clean, developed for the filling of joints from 2 to 15 mm in all types of ceramics and stone material. It can be applied indistinctly in pavements and coatings, both indoors and outdoors, in which special demands are required (antacid), obtaining a decorative, aesthetic, durable, high quality and free of efflorescence. In addition to the usual supports in masonry, it is also indicated for other specials such as metal, polyester, epoxy flooring, old ceramic tiles, etc. It is a product resistant to chemical and bacteriological attacks, is highly resistant to bleaches, salt water, acids, organic liquids and mineral compounds. Grout anti-stain, waterproof and high resistance to abrasion and very fine texture, which allows to perform impeccable finishes. Colours: white, light grey, dark grey, black, beige and chocolate. For other colours ask availability.